Green is my favourite colour and my comfort zone. It’s fresh but not cold. Not screaming for attention, but still visible. I love green. With spring coming, everything turns green again. Ever noticed how green grass actually is? The brightness always amazes me, it almost looks artificial. The idea for this Illustration Friday came from a German website, the artist made several hilarious drawings with the residue of a pencil sharpener. Unfortunately, I can’t recall the name of this website, but it should get some credits. 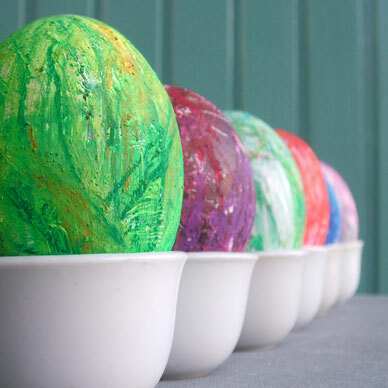 Furthermore, I had a good afternoon dyeing these Easter eggs. 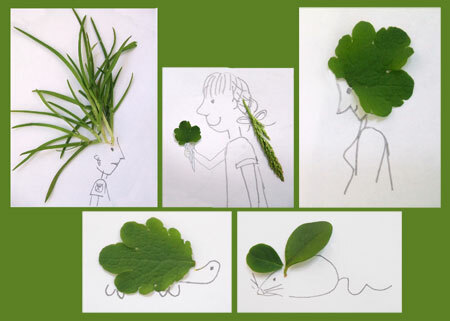 WOW..what an adorable idea for illustration friday! Great idea, beautiful result. I will bookmark your site to show it to my daughter tomorrow – loved it! Dat is ook te merken aan je weblog dat groen je favoriete kleur is. Het is ook heel fris allemaal. Ik vind de tekeningen leuk gevonden en de eitjes vrolijken mijn paasdag op. Great work and great idea! Love how you put the leaves to use! I love it! Very original! green means peace to me. Oh, so nice GREEN collage!!! !